In The Lost and Damned there are two safehouses that are accessible to you. 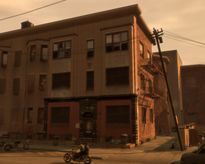 One is the Lost MC Clubhouse, which is much larger than a regular safehouse, and the other is Brian Jeremy's Safehouse, which you obtain after the mission Bad Standing. The Lost MC Clubhouse is large scale safehouse with Hi-Lo cards, an Arm Wrestling table, a Pool table and a QUB3D arcade machine. Your sleeping quarters are in a storage room straight forward when you enter the front entrance. When you finish a certain amount of Gang Wars, you are awarded a weapon that is in the television and computer room. Despite the fact that there is a very large parking space in front of the clubhouse, it actually can only save two vehicles. After the last mission, Get Lost, Johnny Klebitz, Terry Thorpe, Clay Simons and Angus Martin return to the clubhouse, only to find it trashed by the Angels of Death. The four make the decision to burn down the clubhouse, because of all the bad things that it stands for (namely, all the deceased brothers and in-fighting in The Lost). After this mission, the safehouse is inaccessible, although it can be re-entered through a glitch. Brian Jeremy's Safehouse is awarded to Johnny after "Bad Standing" when Johnny seizes control of the building from Brian. Niko Bellic's safehouse parking spots from Grand Theft Auto IV can be used by Johnny to save vehicles aswell. Completing Clean and Serene. Unavailable after Get Lost. Brian Jeremy's Safehouse Tudor, Alderney Completing Bad Standing. Taken by Johnny Klebitz after clearing out Brian Jeremy and the other traitorous former members of The Lost Brotherhood. Here follows a list of all the weapon and vehicle spawns inside and around the safehouses. NOTE: After the final mission (Get Lost), the Lost MC Clubhouse is not available anymore, and its interior and exterior spawn points are disabled. However, all weapons and vehicles will continue to spawn at Brian's safehouse. This page was last modified on 19 August 2013, at 12:27.